Burleigh，Michael，& Wolfgang Vippermann. The Racial State: Germany, 1933-1945. London: Cambridge University Press, 1989. Feng, Jihua. Jewish Culture and Israeli Socialpolitical Development. Beijing: Social Sciences Academic Press (China), 2010. Foster, E. M. Aspects of Fiction. Trans. by Feng Tao. Beijing: People’s Literature Press, 2009. Friedlander, Saul. Nazi Germany and the Jews, 1939-1945: The Years of Extermination. Trans. by Lu Yanming, etc.. Beijing: China Youth Press, 2011. Griffith, Kelley. Writing Essays about Literature: A Guide and Style Sheet, 8th Edition. Belmont, CA: Wadsworth Publishing, 2011. Krauss，Nicole. Great House. London and New York: W.W. Norton & Company. Lanser, Susan Sniader. Fictions of Authority: Women Writers and Narrative Voice. Trans. by Huang Bikang. Beijing: Beijing UP, 2002. Mark，Currie. Metafiction. London and New York: Longman Group Limited, 1995. Todorov, Tzvetan. “Anatomy of Literary Works.” Research on Narratology, ed. by Zhang Yinde. Beijing: China Social Sciences Press, 1985. pp.43-92. Waugh, Patricia. Metafiction: the Theory and Practice of Self-Conscious Fiction. London and New York: Routledge, 2003. White, Hayden. Postmodern Historical Narratology. Trans. by Chen Yongguo & Zhang Wanjuan. Beijing: China Social Sciences Press, 2003. Xu, Xin. Analyzing Anti-Semitism. Shanghai: SJPC, 1996. Zhao, Yifan, ed. Key Words in Western Literary Theories. Beijing: Foreign Language Teaching and Research Press, 2006. 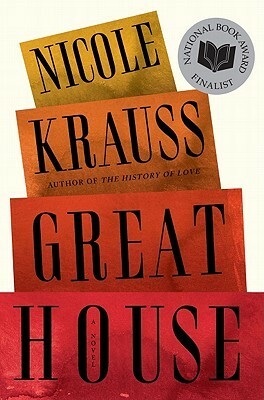 This entry was posted in MY WRITINGS and tagged 《大宅》, American Literature, Great House, multi-perspectives, Nicole Krause, post-modern historical narrative, root-searching, tropes, 后现代历史叙事, 多重叙述视角, 犹太寻根, 美国文学, 转义 by mabokov. Bookmark the permalink.